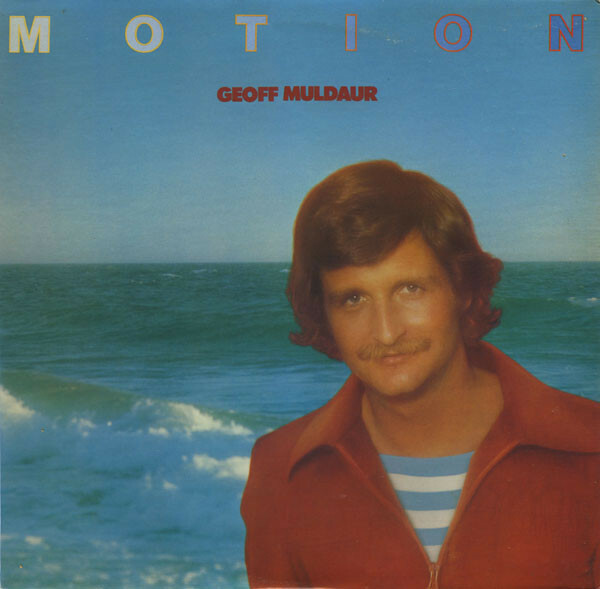 GEOFF MULDAUR-IS HAVING A WONDERFUL TIME AND MOTION. After leaving Paul Butterfield’s Better Days in 1975, Geoff Muldaur decided to resume his solo career. So he signed to Warner Bros. and began work on what would be the followup to his 1964 debut album Sleepy Man Blues. 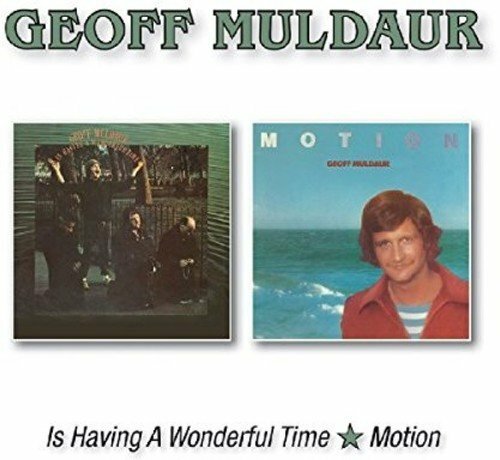 Later in 1975, Geoff Muldaur released his much anticipated sophomore album, Is Having A Wonderful Time on the Reprise Records imprint. It was an eclectic album with widespread commercial appeal. So was the second album Geoff released for Reprise Records. This was his third album Motion, which was released in 1976. Sadly, it was the last album Geoff Muldaur would release on Reprise Records. Forty years after Geoff Muldaur released Motion, it’s receiving a welcome reissue. Both Is Having A Wonderful Time and Motion have been digitally remastered and are being reissued by BGO Records on one disc. These two albums were another chapter in the career of Geoff Muldaur. He was born in Pelham, New York, on August 12th 1943. Growing up, Geoff Muldaur developed a love music. This lead to Geoff learning to play the guitar. Soon, he developed into a talented blues guitarist. Little did he realise that this would be how he would make a living. Jim Kweskin and The Jug Band. Geoff Muldaur’s musical career began in the early sixties, while he was living in Boston. That was where he first met Jim Kweskin, who founded Jim Kweskin and The Jug Band. It would eventually become a nine piece band, that nowadays, is regarded is the original Americana band. To create this new sound, Jim Kweskin and The Jug Band incorporated a variety of different musical genres into their music. Elements of blues, country, folk were combined with the influence of the jug bands of the thirties and even ragtime and rock ’n’ roll.This unique fusion of musical genres and influences made Jim Kweskin and The Jug Band stand out from the crowd. During the early sixties, Boston’s music scene was thriving. A number of jug bands played in the pubs and clubs of Boston. However, Jim Kweskin and The Jug Band were a cut above the competition. They were a tight and talented band who were young, enthusiastic and energetic. It was only a matter of time before a record company signed them up. That proved to be the case. In 1963, Jim Kweskin and The Jug Band signed to Vanguard. Later in 1963, Jim Kweskin and The Jug Band released their eponymous debut album. Its mixture of blues, country, folk and ragtime was well received by critics, and found favour within the folk community. The only downside was that the album hadn’t reached a wider audience. However, when Jim Kweskin and The Jug Band returned to the studio, their number would have risen from five to seven. In 1964, Jim Kweskin and The Jug Band recruited a new vocalist and violinist, Maria D’Amato. Soon, Geoff Muldaur began a relationship with Maria D’Amato, and later in 1964, the pair married. By then, Geoff had released his debut solo album Sleepy Man Blues on Prestige Folklore. The Solo Years Begin-Sleepy Man Blues. Given Geoff Muldaur’s love of blues music, it was no surprise that he decided to record a blues album for Prestige Folkways. For the twenty-one year old blues guitarist and vocalist, this could be the perfect showcase for his considerable skills. Especially if he chose the right songs. For his debut album Sleepy Man Blues, Geoff Muldaur decided to record twelve blues songs by some giants of the Delta Blues. This included Lonnie Johnson’s Jelly Roll Baker; Blind Willie Johnson’s The Rain Don’ Fall On Me; Bukka White’s Sleepy Man Blues, Good Gin Blues and Aberdeen, Mississippi Blues; Jim Jackson’s This Morning She Was Gone and I Have Had My Fun. They were joined by Robert Hick’s Motherless Chile Blues; Peg Leg Powell’s Georgia Skin Game and Sleepy John Estes’ Everbody Ought To Make A Change and Drop Down Mama. These songs were recorded with bassist Fritz Richmond and Eric Von Schmidt on mandolin and harmonica. Once the twelve songs were recorded, they became Sleepy Man Blues. 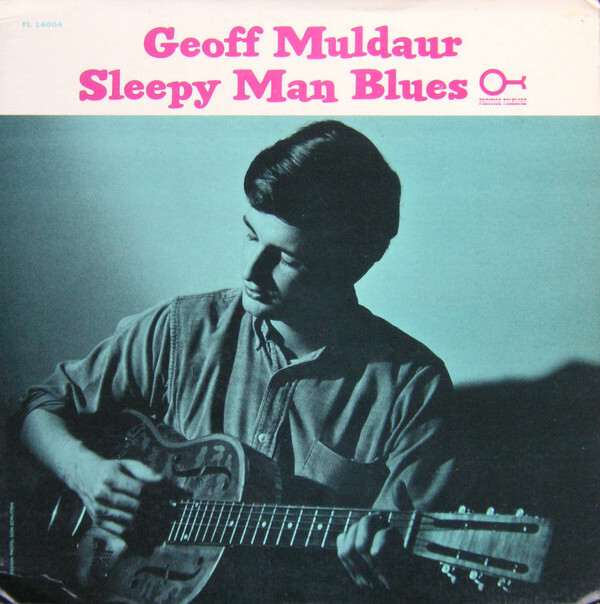 Upon its release later in 1964, Geoff Muldaur’s debut album Sleepy Man Blues was well received by the critics. The album found a following within the blues and folk community. However, it failed to make much of an impression with the wider record buying public. So Geoff returned to Jim Kweskin and The Jug Band. A year later in 1965, the Jim Kweskin and The Jug Band returned to the studio to record their sophomore album. It featured the debut of vocalist and violinist Maria Muldaur. When the album was completed, it became Jug Band Music. Later in 1965, Vanguard released Jug Band Music. It was a similar to story to Jim Kweskin and The Jug Band, with the album being well received by critics. Especially the cover of Memphis, where the song is rem imagined by Jim Kweskin and The Jug Band. Despite a resurgence in interest in folk music, Jug Band failed to find a wider audience. Despite this Jim Kweskin and The Jug Band were influencing a number of band, including members of the Grateful Dead. After the release of Jug Band Music, Jim Kweskin decided to launch his solo career during 1966. The recorded and released his debut album Relax Your Mind in 1966. Then in 1967, work began on Jim Kweskin and The Jug Band’s third album See Reverse Side For Title. By then, Jim Kweskin and The Jug Band had signed to Elektra, which home to many of music’s rising stars. Executives at Elektra hoped that Jim Kweskin and The Jug Band would become the label’s latest rising stars. However, music was changing, and changing fast. Folk rock and psychedelia had overtaken folk in popularity. This didn’t bode well for the release of See Reverse Side For Title in 1967. Jim Kweskin and The Jug Band decided not to change their trademark sound. However, they decided to use a heavier production style. This they hoped would make the album relevant and appeal to a new audience. However, the results were somewhat mixed. When See Reverse Side For Title was released, the album wasn’t the commercial success Jim Kweskin and The Jug Band had hoped. It was the end of the line for Jim Kweskin and The Jug Band. They split-up after the release of See Reverse Side For Title. Meanwhile, Maria and Geoff Muldaur signed to Reprise. Maria and Geoff Muldaur could’ve and should’ve enjoyed much more critical acclaim and commercial success than they did. Geoff was a talented and versatile guitarist. Although blues was his first love musically, he could seamlessly flit between genres. So could Maria as she breathed life and meaning into lyrics. She did this on the two albums Maria and Geoff Muldaur recorded and release two albums for Reprise. The first of these was Pottery Pie in 1970. When it was released in 1970, commercial success eluded Pottery Pie. However, the couple weren’t lacking in talent, and surely, a success couldn’t be far away? Two years later, and the followup Sweet Potatoes was released. While reviews of Sweet Potatoes were mostly positive, history repeated itself. Again, commercial success passed Sweet Potatoes by. However, by then Maria and Geoff’s relationship was at end. They would divorce later in 1972. By then, a new chapter in Geoff’s career had begun. Next stop for Geoff Muldaur was the Paul Butterfield’s Better Days. This was the group Paul Butterfield formed after the break-up of the Paul Butterfield Blues Band. For Geoff, Paul Butterfield’s Better Days would be his musical home for the next few years. Joining Paul and Geoff in the lineup of Paul Butterfield’s Better Days were Amos Garrett, Bill Rich, Chris Parker and Ronnie Barron. With its stellar, multi-talented lineup, Paul Butterfield’s Better Days were the band that should’ve become one of the biggest bands of the seventies. Sadly, the story of Paul Butterfield’s Better Days is one of what might have been. They released just two studio albums during 1973. The first was Better Days, with It All Comes Back following later in 1973. Of the two albums, Better Days is considered one of the great lost albums. It showcases the considerable talents of what was more than a blues rock band. Later in 1975, Geoff Muldaur signed to Warner Bros. Never before had he been signed to a major label. This was unknown territory. However, Warner Bros had the financial and marketing muscle to bring Geoff’s music to the attention of the wider record buying public. So he began work on the followup to his 1964 debut album Sleepy Hollow Blues. Is Having A Wonderful Time. For his sophomore album Is Having A Wonderful Time, Geoff Muldaur wrote Why Should I Love You? The other eight songs were cover versions. They were an eclectic selection of songs, including some that would be familiar to many record buyers. None more so than Carl Smith, Gary Jackson and Raynard Miner’s Higher and Higher, which gave Jackie Wilson a hit single. It was joined by Al Lewis and Al Sherman’s Livin’ In The Sunlight (Lovin’ In The Moonlight); Andy Razaf and Don Redman’s Gee Baby Ain’t I Good To You; Dorothy Love Coates’ 99 1/2 and Robert Denham and Miklós Rózsa’s I Want To Be A Sailor. The other songs Geoff chose were Pam Carrier and Merl Saunders’ Wondering Why, Walter Vinson’s Jailbird Love Song; Huey “Piano” Smith and John Vincent’s High Blood Pressure and Bobby Charles’ Tennessee Blues. These nine songs were recorded A&R Studios, New York. To produce what became Is Having A Wonderful Time, Geoff Muldaur was joined by producer Joe Boyd and engineer John Wood. Both were vastly experienced and successful. This was the perfect partnership to kickstart Geoff’s career. Joining him, was a huge all-star band. At least sixty musicians and backing vocalists would eventually work on Is Having A Wonderful Time. The band’s lineup changed from track to track. However, on every track Geoff Muldaur was working with top musicians. This ranged from musicians Geoff had played with previously, a few of his friends and many of New York’s top session players. It was an impressive and enviable array of musical talent. Included in Geoff’s all-star band, were drummer Bernard “Pretty” Purdie, bassist Ron Carter, guitarists Amos Garrett, lead guitarists Cornell Dupree, Billy Butler and Richard Thompson. John Cale formerly of the Velvet Underground, played viola; Bob Siggins of Jim Kweskin and The Jug Band played banjo and Geoff’s ex-wife Maria Muldaur played violin and added backing vocals. They were joined by a horn section, backing vocalists and The Capitol City Stars. With such an abundance of talent on display, Warner Bros. must have had high hopes for Is Having A Wonderful Time, once it was completed. With Is Having A Wonderful Time completed, now the might of Warner Bros’ marketing machine could get behind the album. It was due to be released later in 1975 on Warner Bros’ Reprise Records’ imprint. Before that, critics had their say on Is Having A Wonderful Time. On receiving their copies of Is Having A Wonderful Time, critics discovered a truly eclectic album. Geoff Muldaur transports the listener back in time, as he croons his way through Livin In The Sunlight and Gee Baby Aint I Good To You. This gives way to the funky blues of 99 1/2. Jazz and blues then combine on I Want To Be A Sailor, as Geoff delivers a needy, hopeful vocal. Higher and Higher is totally transformed as the tempo is dropped, and horns punctuate what becomes a joyous ballad. It’s followed by Wondering Why, a spacious, jazz-tinged ballad, where Geoff breathes meaning and emotion into the lyrics. Jailbird Love Song finds Geoff and band seamlessly fusing elements of blues and country to create a heady musical brew. The same can be said of High Blood Pressure where elements of boogie-woogie, blues and jazz combine head-on, Closing Is Having A Wonderful Time, is a beautiful, understated cover of Bobby Charles’ Tennessee Blues. Without doubt, the best has been kept until last on this captivating album. Given the quality and variety of music on Is Having A Wonderful Time, it was no surprise that the album received critical acclaim from the critics. This was half the battle. However, how would record buying public react? Is Having A Wonderful Time was released later in 1975. Alas, the album wasn’t a success and failed to even trouble the charts. Geoff Muldaur’s genre-melting album Is Having A Wonderful Time, slipped under the musical radar. For Geoff, this was a huge disappointment. Despite the disappointing sales of Is Having A Wonderful Time, Geoff Muldaur began work on the followup album, Motion. He chose another nine songs. This included a couple of familiar songs, Southern Nights and I Don’t Want To Talk About It. These tracks had given Glen Campbell and Rod Stewart hit singles. Now was the time for Geoff to rework them. Among the other tracks he decided to record on Motion, were Let It Out, Since I’ve Been With You Babe, What Do You Want The Girl To Do? Motion, When You Touch Me This You, Why Don’t We Live Together and Hooray For Hollywood. These songs were recorded with a different producer, Trevor Lawrence. He replaced producer Joe Boyd, who had produced Is Having A Wonderful Time. Another change was that the huge, all-star band had been scaled back. Maybe Warner Bros. were having second thoughts about Geoff Muldaur and were scaling back the budget? Still though, Geoff Muldaur was accompanied by a tight, talented band. Their lineup changed throughout the album. However, what had changed was the quality of musicians in Geoff’s band. It included drummers Jim Keltner and Ed Greene; bassists James Jamerson and Klaus Voormann plus guitarists Dean Parks, Dennis Coffey and Jesse Ed Davis. They were joined by saxophonist Bobby Keys, keyboardist Dr John and Bonnie Raitt who featured on two songs, Since I’ve Been With You Babe and Motion. Geoff and his new band and producer got to work. Eventually, nine songs were recorded and became Motion. Reprise Records scheduled the release of Motion later in 1976. Before that, critics received copies of Motion. They had given Geoff’s previous album their seal of approval. Geoff and executives at Warner Bros held their breath while they awaiting the reviews. Bad reviews had the potential to kill an album. Motion opened with Let It Out, a driving and irresistible fusion of blues, country, funk and rock where Geoff sound not unlike John Fogerty. Since I’ve Been With You Babe is another uptempo track, where Bonnie Raitt proves the perfect foil to Geoff. They combine to create a slick, radio friendly track. What Do You Want The Girl To Do is the first of the ballads on Motion, and marries elements of AOR with country and soaring gospel harmonies. It’s one of the highlights of Motion. So too is Motion, which is another ballad. It marks the return of Bonnie Raitt, who provides the perfect accompaniment to Geoff’s vocal on this understated and beautiful ballad. After this, it’s all change. The tempo rises on When You Touch Me This Way, where the hooks haven’t been rationed as rock combines with funk. Geoff’s band create a funky backdrop as sultry and soaring harmonies accompany him. This results in another slick, radio friendly track. It’s a similar case with Why Don’t We Live Together, where elements of AOR, country and pop stylings combine seamlessly. Southern Nights is then reinvented as the tempo drops, and Geoff delivers a languid, heartfelt cover. He stays true to the original of I Don’t Want To Talk About It. So much so, it’s as if he’s lived the hurt and heartache. Closing motion is a string-drenched cover of Hooray For Hollywood. It bursts into life, with a piano, harp and harmonies playing a leading role as Geoff Muldaur takes his bow with this dance-floor friendly track. Critics were won over by Motion, which continued to showcase Geoff Muldaur’s versatility. He was equally at home on the uptempo tracks as he was on the ballads. Motion was a slick, polished album that was commercial and radio friendly. More so than its predecessor, Is Having A Wonderful Time. Surely, the much more commercial, radio friendly Motion would transform the fortunes of Geoff Muldaur? Sadly, it wasn’t to be. History reposted itself and Motion failed to chart. It was the wrong album at the wrong time. Again, music was changing, and changing fast. Rock was still King, but disco was growing in popularity by 1976. Punk had just reared its ugly head and the repercussions were already being felt. Sadly, it was a similar case for Geoff Muldaur. Following the commercial failure of Motion, Geoff Muldaur was dropped by Warner Bros. He been with the label since 1975, and released two hugely underrated albums, Is Having A Wonderful Time and Motion. They’ve been digitally remastered and have recently been reissued by BGO Records on one disc. This is the perfect opportunity to discover two hidden musical gems. They’re two very different albums. On Is Having A Wonderful Time, Geoff and his band combine elements of blues, boogie-woogie, country, folk, gospel, R&B and rock. Then on Motion, Geoff is steered in different directions by his new producer Trevor Lawrence. Motion takes on a much slicker, radio friendly, commercial sound. Geoff combines AOR and country with gospel, pop and rock. Ballads rub shoulders with uptempo tracks on Motion which should’ve caught the imagination of the record buying public. Sadly, it wasn’t to be. After just two albums, Is Having A Wonderful Time and Motion, Geoff Muldaur left Warner Bros. It was a case of what might have been for Geoff Muldaur? He was and still is a hugely talented and versatile vocalist. That’s apparent from his much anticipated sophomore album Is Having A Wonderful Time, and the followup Motion. They showcase the different sides to Geoff Muldaur on two hidden musical gems, Is Having A Wonderful Time, and the followup Motion. ← JETHRO TULL-STAND UP AND AQUALUNG BOX SETS.